Let's start with temples of goddess first . While in other places On your way to Bokakhat first you will be blessed by "Burhimai Than" the temple of old mother that refers to Durga. Among the tribes (specially Kochari) Burha -Burhi refers to Siva -Parboti . It is situated in Bagari by the side of the N.H. 37 . Though new it is a beautifully decorated temple originally it was known as "Sopa Khowa Sil" . Only a stone was there which people worshiped as god cordially . Otherwise people feared for same omen. Now besides Durga temple there is a Siva temple in the midst of water . There are the idols of Ram , Laksman and Sita . Now the wedding or other religious ceremonial functions are performed here. It you have luck you may witness one of it. Secondly "Kako Gosani Than" will after here blessing upon the visitors . 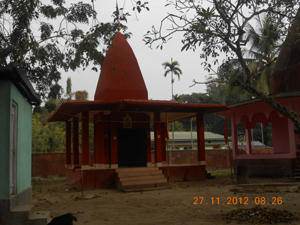 This is also the temple of Durga who was carried in a piece of 'Kako' bamboo. It is said in 17th century .There was a political crisis in Ahom period in Assam . Then the Ahom king was Sulikpha who was mere a child . His father-in-law Laluksola Borphukan then administered the kingdom . On behalf of the boy king "Lora Raja: . To make the throne safe for him Borphukan began to maimed the Ahom princess so that according to custom they might not be able to demand the throne. But the prince Langi Gadapani alias Gadadhar Singha of Tungkhungia dynasty fled away . His wife Joymoti was severely tortured and killed . In his abscending period Gadadhar Singha carried same golden idols of Devi Durga with him in his bundle of cloth and inside the hollow piece of Kako Bamboo . He used to worship her. One day he was resting under a tree of "Am Tenga" , a kind of acid fruit by "Naramara bill(lake)". Sunddenly the spies of the king surrounded him . He started and threw one idol to the lake and escaped . This idol was later brought up by the villagers and set up a temple on the Diring river . Now its place has been changed . In the west of Bokakhat it is placed . Durga puza and Basanti Puza are performed here pamparsly. Animal sacrifices even buffalo are also made in these occasion . Daily worship is also going on . 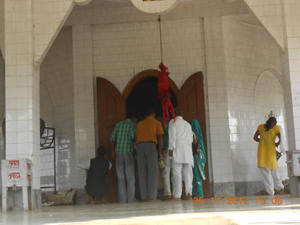 People of different religious often visit this temple . Besides the old building a new building has been built recently . A beautiful gate the N.H. 37 indicates its location . Thirdly one famous than is 'Chatai Thaan' . This goddess is also known as Kako Gosani Thaan. It is situated by Bokakhat Diffaloo road . It is one and half kilometre south from Bokakhat . This temple is also connected with Gadadhar Singha . In his absconding period he stayed at Panbari village in the house of a Karbi Gaonburha named Malasi .He used to herd the cattle here and secretly worshipped the goddess placing it under a 'Chatiyana tree' . One day Malasi Gaon burha detected him and sent him to the astrologer Arjun Daibajna of Jyotipur village . He later became famous as Tora Bordoloi . Here he left one of the idols. It was recovered afterwards and set up a temple here. So it is called Kako Gosani Thaan as well as Chatoni Thaan. Now around the old temple two other temples of Siva and Ganesh are newly. 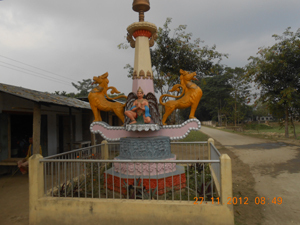 Fourthly Phuleswari Thaan is in Jyotipur village . In fact Assamese mythology in rich in goddesses . According to our Folk tales there are seven 'Aai's'(mother) . One of these 'Aai's' is Phuleswari Aai . Hozai dances are usuall in Durga or Basanti puza in such temple. Such one Topa Hozai was once forbidden from the Chatani Thaan worshipped the goddess at home . He found 'flower & balpat' made of gold under the ground . Next a wooden plate was found in Diffaloo river where the outlines of goddess Parvoti was drawn. Later Yadav Khonikar of Rajabari painted it . There is same black things which is growing up from the flower is regarded as same idols. A temple is also built here . People regarded this temple as living and gracious. 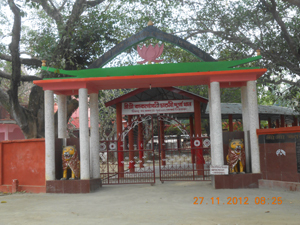 Fifthly 'Sitola Aai Thaan' is situated near Bokakhat Tea Estate at Garmurh village . It is established in 70's decade of 20th century . This goddess is also regarded as one of the important 'Aai' of those seven 'Aais' . Many people of different cast , community and religion visits this temple on Tuesday and Thursday of every week to know about their future to offer worship. 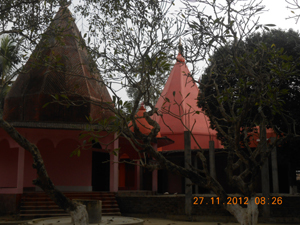 Sixthly 'Burhi Gosani Thaan' welcomes the religious persons for a long time in Khotiakholi village . It is also connected with the king Gadadhar Singha . In his abscending period once he visited this area .He bought this idol in a bundle of cloth . Once he dreamt that goddess wanted to line in the 'Jari tree' . He left her there. Later the villages saw same supernatural incidents and set up a temple there. After offering prayer in this temple many people have got their desire. So out of gratitude they built the 'pucca' temple. Now it is the turn of Gods . Let's first start with the most ancient Siva Temple known as 'Babathaan'. 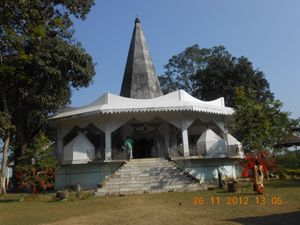 On the way to Golaghat at least three kilometers away from Numaligarh Tini Ali this ancient Siva Temple is situated. Probably it was set up in the last part of 19th century . At first it was on the 'Deopahar' . 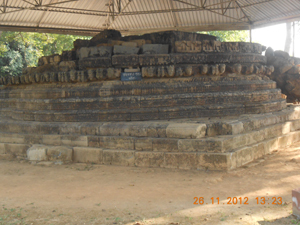 Some says it was a seperate hillock top of which this temple was built . But for earthquake , cyclon or some battle whatever may be the cause it is destroyed . 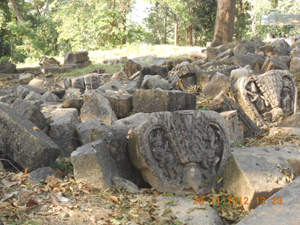 Now wrecks and ruins an 'Deopahar' tells us regarding this . It is said that as the old priest Narayan Kandoli was too old to climb up the hillock he brought the idol with honour to this very place where it is situated now. One British Manager probably some Humphrey built the temple and decorated with some old sculpture of ancient temple known as flying Apsara , Gajathan etc. But lack of proper care these are also destroyed . Now a new building is being built here. The specialty of this temple is that 'The Linga Murty' is on the ground while most of other ancient Siva Linga are placed under the ground in a hole. 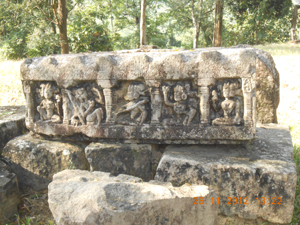 Animal sacrifices ias also made here which is rare in other temples . Probably this is the influence of Kachari Kingdom . Kuruabahi Satra :- One of the four pioneer 'Satras' of Assam, the Kuruabahi Satra is enhancing the glory of Bokakhat . It has been prealing "Mahapurusiah" doctrine here took now . It is situated in the east of Bokakhat . In the midst of 17th century and in the reign of Ahom Pratap Singha it is established . Due to erosion it has also been to change to the present place. 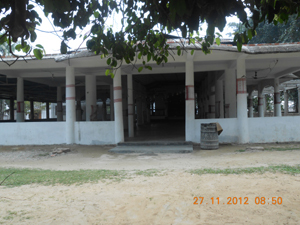 A Brahmin of Konauj named Sri Sri Bansigopal Dev established this satra . It became the centre of religion , culture etc. It is the symbol of rich Assamese culture . Chikun Atar Thaan:- As a glorious symbol of 'vaisnavite' religion Chikun Atar Thaan stands here in the north of Bokakhat on the Bokakhat Dhansirimukh road. 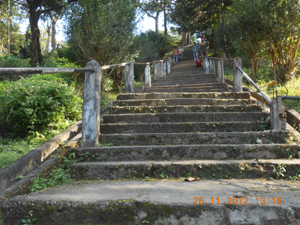 It is famous as the burial Place of Chikun Ata of 'Sesa Satra' . The time of its establishment is not clear . But recently it has been built newly. Destination Hill :(Nichan Pahar) :- It is also connected with Gadadhar Singha . Originally it was a watch tower . Some people say here Gadadhar Sigha practiced his archery . There is a stone plate and pond. 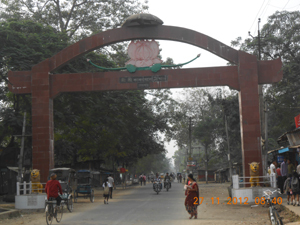 Joy Bijoy Pukhuri :- A symbol of victory situated by the side NH 37 . 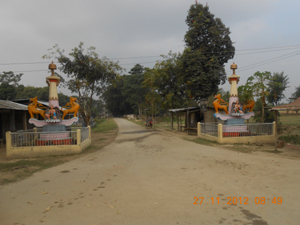 According to Historians after slaiming Mogal general Turbak Ahom General Konseng Barpatra Gohain returned through this road . He dug these ponds by the thousand pathan war captives which brought with him . Now Joy Pukhuri does not exist . Bijoy Pukhuri is still existing in this place. The students Union here on the bank of it setup a park and surrounded the area. Diffaloo Satra : Once on the Diffaloo river in the present Karoiati gaon Krishna Chandra Dev, the youngest on Mishra Dev established Satra here. But after Man-invasion the Satra has been transferred. Gosani Bor: Four kilometers wets of Diffaloo river Gadadhar Singha established oa "Devi Than" . But new it does not exist now here was a pond also . It has also been illed up . Rajgarh :- From the end of Numaligarh Rajgarh streched through Kuruabahi upto Lohowgarh . Probably these are built by Ahom King Dihingia Raja for defence. 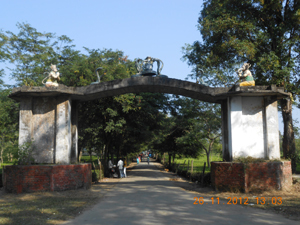 Numaligarh :- This Numaligarh is situated at the juncture of the NH 37 and NH 39 . 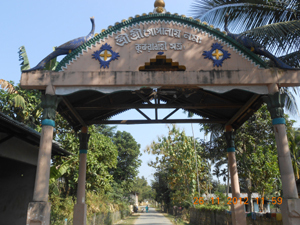 It is known after name of 'Numali Konwari' , a legend of Assam. There are several saying regarding this Queen . But most reliable one indicates that she belong to Kochari Kingdom. After the name of her it is called Numaligarh. 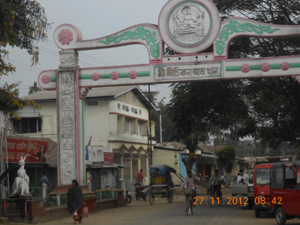 It is stretched from Dhansiri Bihora 12 No. Majdoor line.